Published by the ECPR in association with Oxford University Press, the Comparative Politics Series is a series of long-lasting repute. 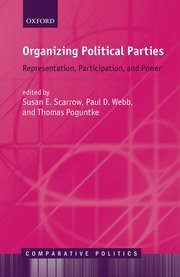 Founded in 1990, the Series is devoted to the comparative study of contemporary government and politics, with a specific interest in the comparative domestic politics of institutions and political actors. Global in scope, books in the Series are characterised by a stress on comparative analysis and strong methodological rigour. The Series aims to publish cutting edge, in-depth analyses on these topics, and to provide a forum for scholars to share their work on themes ranging from democracy, electoral reform, money and politics, parliaments, cabinets and coalitions, representation, political leaders and personalisation, party organisations and intra-party democracy, democratic linkage and public opinion. Whatever the focus, the Series has ambitions to be at the forefront of scientific debates in the field. Titles are nominated regularly for awards, including various APSA prizes and the CPSA Prize in Comparative Politics.